This paper offers a short review of High Altitude Platform Stations (HAPS) technology that promises a low-cost and quick access to modern telecommunication services. Such a perspective has been appealing to all users in areas where the modern telecommunication infrastructure is lacking. With all its promises fulfilled, the HAPS technology will contribute significantly to bridging the “digital gap” and to improving the emergency and security communications. It will also offer an attractive alternative to the present solutions to the “last-mile-problem”. The HAPS, known also as HALE (High Altitude Long Endurance) stations or SPR (Stratospheric Platform Radio) are reusable unmanned aeronautical vehicles (UAV) at stratospheric altitudes that offer an alternative to the terrestrial and satellite telecommunication systems. They promise access to modern telecommunication services in many situations at lower costs and shorter deployment times. The HAPS can equally well be used in both, mobile and fixed services, but detailed discussion of fixed applications goes beyond the scope of this article. Locating radio stations at higher altitudes to obtain better services over greater areas is not a new idea. High antenna masts have been used since the beginning of radio, and satellite technology has put the antennas at altitudes of hundreds or even thousands kilometres. The HAPS aim at exploiting potential benefits of intermediate altitudes between those used by the terrestrial and satellite technologies. Studies on HAPS have started at a few universities since the late 1950s. As the work was progressing, numerous potential applications of high altitude platforms have been identified. The technology has been recognized as a critical future technology and several governments decided to invest capital and intellect in its development. Consequently, systematic studies have been undertaken in China, Germany, Hungary, Italy, Japan, Korea, Slovenia, Spain, Switzerland, UK, and USA. The European Space Agency (ESA) and International Telecommunication Union (ITU) have been involved in this area since the late 1990s. The Wireless World Research Forum (WWRF), created to formulate visions on strategic future research directions and to generate, identify, and promote research, has included HAPS into their program in 2001. With all that involvement, the perspectives of practical application of that technology are becoming realistic. On a basis of various concepts proposed, the ITU has elaborated a common understanding of HAPS. Accordingly, the HAPS are understood as stations “located on an object at an altitude of 20 to 50 km and a specified, nominal, fixed point relative to the Earth”1. This definition does not mention if the “object” is piloted or unmanned or how is it powered. HAPS are to be positioned well above commercial airspace at an altitude that is high enough to provide service to a large footprint, providing broadband (and narrowband) services with minimal ground network infrastructure. The common vision foresees that HAPS systems will consist of one or more quasi-stationary HAPS, each associated with several ground stations, and with numerous mobile and fixed subscriber stations. Each HAPS can deploy a multi-beam antenna capable of projecting numerous spot beams within its potential coverage area. The HAP stations will inter-work among themselves, and with other networks, terrestrial, satellite, public and private. The system concept is global in nature, but national/ regional in service provision. The HAPS are to operate at unusually high altitudes. Such altitudes have not been used until now by telecommunication systems (except perhaps for those related to scientific research), and a number of new questions arise. Some of them are reviewed below. The paper is organized as follows. First, we look at winds, pressures, and temperatures in which the HAPS are to operate, and which differ significantly from what we know from low altitudes. Then, we discuss how higher altitudes offer large service area and long free-space signal propagation paths with reduced latency, attenuation, and multi-path distortions. We also discuss how the energy necessary for the station’s operation can be delivered at stratospheric altitudes. Two sections of the paper review generic applications and examples of HAPS systems described in the open literature. The paper concludes with a short review of regulatory aspects and a summary. Lists of references and abbreviations are added at the end. The stratosphere is a part of the Earth’s atmosphere, which consists of several distinct layers. The lowest one is the troposphere. It extends from the Earth’s surface to the tropopause about 10 to 18 km in altitude, depending on the season and geographical position. In the troposphere, the air temperature generally decreases with height. The air pressure decreases from about 1000 hPa at the sea level to about 100 hPa at the tropopause altitude. Approximately 80% of the total air mass resides here, and almost all weather phenomena. The stratosphere is the next layer, extending from the tropopause to the stratopause at about 50 km. The ozone layer resides here and more than 99% of the total air mass is concentrated in the first 40 km from the Earth’s surface. The stratosphere is characterized by a high static stability associated with increase of temperature with height. The pressure decreases further to reach about 1 hPa at the stratopause. The mesosphere extends from the stratopause to the mesopause at about 90 km, where the pressure is 0.01 to 0.001 hPa. Most of meteors burn up in the mesosphere as a result of collisions with gas particles there. Higher, up to 300 km, the thermosphere is located. Here, aurora phenomena occur. The exosphere located above the thermosphere is the most distant atmospheric region, a transitional zone between the Earth’s atmosphere and interplanetary space. Figure 1 shows the speed of winds in the atmosphere. Note that diagram in Figure 1 gives average speed in m/s (and must be first divided by 1000 to get it in km/s, and multiplied by 3600 to obtain km/h). The wind speeds vary according to the season, geographic position and temperature gradient. They are highest at altitudes of about 12 km, 70 km, and 100 km. At altitudes of about 20 km and about 90 km, the air masses are relatively stationary, with very slow winds only. That is why most of stationary high altitude platforms are to be located at the altitude of about 20 km. 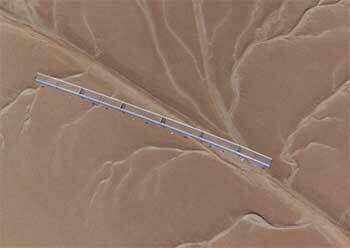 The communication range of high altitude platform station depends on the platform altitude, signal arrival elevation angle, and the Earth’s dimensions. Figure 2 shows the maximum diameter of the line-of sight (LOS) coverage area for station altitudes from 10 m up to the geostationary satellite orbit. The diagram was created exploiting the fact that microwaves employed by the HAPS propagate along almost straight lines, like the visible light. In the first approximation, the higher is the antenna located, the greater is the station range, but there is a limit. The maximal diameter of the coverage area is somewhat less than the Earth's diameter. Figure 2. LOS distance coverage range for altitudes 10 m ...100’000 km (note logarithmic scales on both axes). Terrestrial stations with antennas at an altitude of 300 m have LOS range limited to few dozens of kilometres. The coverage of terrestrial systems depends heavily on the terrain topography. The signal angle-of-arrival is generally low and effects of attenuation, shadowing, and reflections are strong due to terrain irregularities, buildings, etc. In hilly regions, it is often practically impossible for terrestrial systems to assure a uniform coverage without “black holes” where the signal intensity is too weak to assure their normal operation. The HAPS and satellite systems suffer less from the shadowing and multi-path distortions because they use high angle-of-arrival signals. The range of LEO and MEO stations is limited to about 7,000 km. The coverage of a satellite on the geostationary orbit approaches 40% of the Earth’s surface. However, the northern and southern regions cannot use signals from the geostationary orbit because of their low arrival angle above horizon. High altitude platform stations are somewhere between terrestrial and satellite systems. Located at 20 km altitude they have coverage areas of 1000 km diameter and 800 thousands square kilometres, for zero-elevation angle. Figure 3 shows the LOS distance range for elevation angles zero to 90 degrees. Note that the two-way time delay for traffic to-and-from a SHARP platform will be negligible (compared to those for satellite links) because of the proximity to the Earth. Within the maximum LOS coverage area, there may be numerous cells served by separate antenna beams. Adjacent cells may use different frequency channels, as in terrestrial mobile systems. Figure 3. LOS distance range for the altitude of 20 km. (note logarithmic scale on the vertical axis). The angle of signal arrival makes a significant difference in the signal propagation mechanism. In urban areas and low angle-of-arrival signals, usually a major part of signal propagation path penetrates the build-up layer. This increases signal attenuation and introduces signal distortions due to reflections and multi-path propagation. With high angle-of-arrival signals, the major part of the propagation path is in free space. Assume, for instance, a simplistic model of 20 km HAPS over an urban area with high buildings, say of 200 m high (50 floors 4 m high). Over a circle of 40 km diameter, the signal angle of arrival is 45o...90 o. It follows from the distance proportion (20 m to 200 km) that within this circle, 99% of the signal propagation path is unobstructed and only 1% penetrates through build up structure. With lower height of built-up layer, say 20 m, that percentage became 99.9% and 0.1%, respectively. There are two families of high altitude platforms that operate under different physical laws: aerodynes, which are heavier-than-air, and aerostats (balloons or dirigibles), which are lighter-than-air. The aerostats exploit the buoyancy force discovered by Archimedes more than 200 years BC. The Archimedes Principle states that a static object submerged in the air is subject to a buoyancy force that is equal to the weight of the air displaced by that object. Modern aerostats are usually filled with helium. They float in the air in the same way that a ship floats in water, and can stay in a fixed place in the air without movement. If no movement is needed, their energy needs are defined solely by the mission equipment they carry. The aerodynes exploit aerodynamic forces, discovered by Daniel Bernoulli (1700-1782). He found out that the total energy in a steadily flowing fluid system is constant along the flow path: when flow speed increases, pressure decreases and vice versa. For instance, an airplane wing is designed so that the air speed is higher over the upper surface than on the lower one. Thus, the pressure on the top surface is lower than the pressure on the bottom surface. This difference in pressures provides the lift force that keeps the airplane in the air. For lifting force to compensate the craft weight, an adequate forward thrust must be provided by propellers, jet engines, or other thrusters (gliders with no engines gain their thrust from gravity).2 It follows that the aerodynes cannot float without move and that all such platforms have to circle above the coverage area. The circle size depends on the platform speed, and it is difficult to keep it less than a few kilometres radius. With the platform circulating along a large circle, there might be problems with varying antenna pointing and radio wave polarization mismatch. A number of stratospheric aerodynes carrying fuel reserves on the board have been developed for military purposes. One of first such platforms was famous U-2 spying plane shot down in the Soviet Union 1 May 1960. 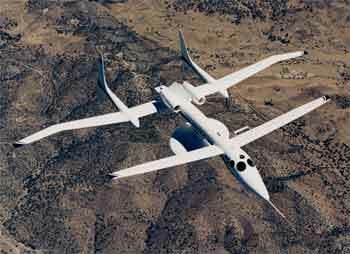 In 1986, an experimental plane (Rutan Voyager) with a crew of two, proved an endurance of 216 fly hours without interruption (however at moderate altitudes).3 A more recent stratospheric airplane, Proteus (Figure 5), is capable to lift 1000 kg payload to an altitude of 20 km and circulate there for 14 hours or so. Figure 4. Proteus aircraft, version adapted to serve as stratospheric-altitude communication platform. A disk-shaped antenna is visible below the aircraft’s body. For unlimited operation endurance, the vehicle should preferably be unmanned, and there already exists a number of Remotely Piloted Vehicles (RPV) and Unmanned Aerial Vehicles (UAV). Figure 5 shows the prototype of Predator aircraft in a version adapted to scientific tasks during its test flight in 2001. It will fly at 20 km altitude with 300 kg payload during 48 hours.4 A prototype of Global Hawk UAV can fly at more than 20 km, travel 2000 km to an operation area, and remain on station for more than 24 hours before returning to base.5 Note, however, that the gases exhausted by the engines disturb the delicate chemical/ thermodynamic balance of the stratosphere and the long-term consequences of such platforms on the climate and life on the Earth are unknown. The Sun is the most natural energy source for stratospheric platforms located above clouds. The efficiency of photovoltaic cells has been significantly improved, making solar energy an attractive alternative to power high altitude platforms. As quasi-stationary stations experience the same day-night cycle as any point on the Earth surface, solar cells can produce electricity only 12-hours a day. Energy drawn from solar radiation during the daytime must thus be stored for use at night to assure continuous operation of station. The regenerative fuel cells (RFC) which use water as fuel are to be used for that purpose. During the day, the water is decomposed into hydrogen and oxygen in the electrolytic process. At night, the chemical reactions run backwards producing electricity and water with no pollution. Based on electrochemical processes, they are not limited by the efficiency of thermodynamically reversible engines (Carnot cycle). A recent prototype of solar powered high altitude aerodyne – HELIOS is shown in Figures 6 and 7. Helios represents the fifth generation of such platforms developed under the auspices of NASA since the 1990s. Its extra-light construction and aerodynamics are adapted to low-speed flights in the troposphere and to tight turn radius. 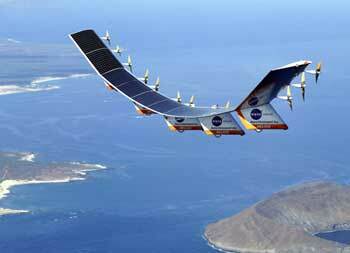 Designed for high reliability and long flight duration (of the order of 6 month) without landing, Helios has beaten the world record reaching an altitude of 30 km in August 2001. According to the manufacturer, it can lose multiple motors and still fly. Solar cells, deposited on large transparent wings of over 35 m span, collect energy from direct Sun rays and also energy reflected from the Earth surface, thanks to the wings’ transparency. That transparency can be noted in Figure 7. 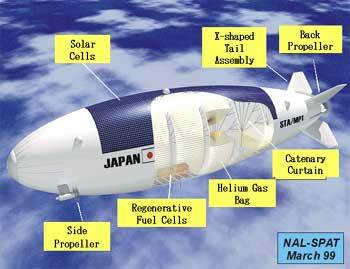 Figure 8 shows a Japanese airship and its functional blocks. Table 1 summarizes major characteristics of high altitude platforms. Source: Teruhisa Hori: Overview of HAPS R&D Project; Sixth APT Standardization Program Forum, 4-6 June 2002. Location services including air and maritime traffic control. Continuous fixed and/or mobile services over months or years, including audio, video, and data transmissions, computer networking and access to the public network and Internet at relatively low cost. Air-borne radio stations were used sporadically in the past for military purposes such as jamming of enemy radio communication and radar installations. In 1999-2000, an aerostat at 3 km altitude was used by TV Marti to send TV transmissions from Florida to Cuba, which generated ITU interventions.6 When the Ostankino TV antenna in Moscow, Russia, was damaged by fire in 2000, airplane-born transmitters continued the program transmissions. Until now, however, no stratospheric stations have been put into commercial operation. Some potential applications of that technology are discussed below. The need for fast broadband communications can probably never be fully satisfied, as the needs grow faster than the current technology can offer. There are two obstacles in making it the broadband access popular. The first one results from the different treatment of audio, video, and data and separate standards used in wireless and wired telecommunication networks. That obstacle will eventually be overcome by the new integrating standards and new version of Internet protocol IPv6. The second obstacle is the very high cost of cabling at the user’s premises. It is known as the “last-mile problem” as seen from the service provider’s perspective or “first-mile problem” from the user’s perspective. The HAPS can offer a cost effective solution to that problem. This is appealing to small-medium enterprise (SME) and small office/ home office (SOHO) users. In future, when wideband services such as high-definition digital interactive television or video telephony are more popular, it may be a major market. Progress in electronics and telecommunications makes it possible to process reliably more information, in shorter time, and at low cost. Based on wireless communications, laptop-computers and their pocket and palm equivalents are becoming more and more popular. Combined with cell phones, they create a new brand of portable “personal assistants”, with merged functions of information processing, storing, displaying, as well as information receiving and transmitting via microwaves. The speed of processing information by these devices exceeds greatly the transmission capabilities of most radiocommunication systems presently in operation. Here, wideband HAPS could replace or complement wireless terrestrial access points. For many reasons, it is more difficult to maintain the required quality of service in radio-based networks than in wired ones. Multi-path signal distortions and blind spots in coverage is the price paid for the mobility. There are various means and ways under development promising to overcome that problem. We can mention here concepts of differentiated services and reservation protocols, as well as improvements in the idle and in-session mobility management. The idle mobility management deals with initial resource allocation and delivery services within a given time delay budget and overhead signalling volume. The in-session mobility management deals with handoffs and radio resource re-allocations during the ongoing session. Handoff is the process of transferring a communication in progress from one cell transmitter- receiver-frequency set to another cell transmitter- receiver-frequency set without interruption of that communication. When implemented, these means will eventually change the information transmission over the Internet from its current best-effort-quality to guaranteed-service-quality in wired and wireless networks. Mobility management is a collection of techniques used to locate and keep track of user’s locations. Martin Griffiths, then Director of UN Department of Humanitarian Affairs described the problem as follows: “In all emergency operations, high-risk decisions must be taken early on often based on unverifiable [...] estimations. Facts change wildly from day to day. Search and rescue, medical relief, food aid, shelter and rehabilitation issues all [have] to be accessed and prioritised almost simultaneously.”7 Tight time limits, combined with surrounding post-disaster chaos and the lacking resources in situ, impose the highest demands on the management, logistics, coordination, and communication efficiency. Location-specific services, such as navigation services or local information services (called often “mobile yellow pages”, “nearcasting”, etc.) are based on quick and accurate determination of current coordinates of the user’s location. As an example, we can mention here automatic positioning and simultaneous tracing of multiple vehicles and other objects, animals, or persons in move (or moved). It could contribute to theft detection and tracking stolen animals, vehicles 9 , and goods, and hijacked persons, with its time-position coordinates registered if needed. Eventually, such services may become a permanent element of public/ personal safety systems and a substantial part of fleet management systems. The HAPS can make these services widely accessible and cost-effective. The location precision offered by the present global navigation/ positioning systems such as GPS of the USA, Russian GLONASS, is insufficient for a number of critical applications. The future European Galileo system will have similar limitations. The differential or augmented positioning systems can increase substantially that precision. However, an additional signal is required for that purpose. Such a signal is now disseminated by terrestrial and satellite stations. The HAPS can be a cost-effective alternative in distributing that augmentation signal over large areas. The HAPS may be used to collect data from various sensor networks. Meteorological/ hydrological sensors distributed over often-inaccessible regions are an example. As natural disasters such as floods tend to occur at random in time and space, gathering and monitoring data from such sensors is necessary for forecasting and issuing warnings required by disaster relief agencies and the public in order to mitigate loss of life and property. SHARP (Stationary High Altitude Relay Platform) was the first high altitude platform station program of the Communications Research Center (CRC) of Canada. The project was build around a microwave-powered and radio-controlled airplane of 40 m wingspan (mentioned earlier). The airplane was to circle at an altitude of 21 kilometres, relaying telecommunication signals, and providing surveillance and monitoring services over a coverage area of about 600 km diameter. The SHARP was to offer mobile and personal communications, broadband fixed radio, and direct-to-home multichannel television and sound broadcasting. Figure 9 shows the concept. 10 A 10 m diameter rectenna was to collect 25 kW power needed by its 100 kg payload and brushless motors propelling the airplane with the maximal speed of 180 km/h for many months without interruption. To minimize the negative impact of microwave beam the power flux density was purposely kept low by using large diameter of microwave beam and antennas. Sky Station is the name of a solar-powered aerostatic HAP system planned by Sky Station International.13 Initially, ion engines were envisaged. A single platform will provide mobile and fixed telecommunication services to an area of 150...1000 km diameter using spot-bam antennas. The planned data rates are 2 Mbps uplink and 10 Mbps downlink in fixed services. For mobile applications, 16 kbps for voice and 384 for data are planned. The cost of a worldwide broadband infrastructure is estimated at $2.5 billion. The Airborne Relay Communication (ARC) system is an aerostatic platform planned by Platforms Wireless International.15 It is designed to operate at sub-stratospheric altitudes of 3...10 km. Originally, it was designed for defence radar uses. Its communication version is to provide fixed and mobile broadband services to areas of 55 ... 225 km diameter, servicing up to 1.5 million subscribers. SkyTower is a solar-powered radio-controlled aerodyne platform planned by SkyTower Telecommunications.16 It is based on Helios airplane (mentioned earlier). The interactive network systems are being designed for the total throughput of 10...20 Gbps per platform (125 Mbps per user), with an average transmission speed of 1.5 Mbps. The company claims that the system, applied to solve the last-mile problem, will have over 1000 times the broadband local access capacity of a satellite (as measured in bit-per-second- per-square kilometre), a fraction of the cost of cable and DSL to deploy (as measured in dollars-per-subscriber) and to be capable of set up in days. In June-July 2002, the first HDTV and IMT-2000 transmission capabilities were successfully demonstrated, including video telephony using an off-the shelf handsets and Internet wireless modem at a speed of 384 kbps. A formal authorization is necessary before a high altitude platform station can be put into operation. Usually, at least two national authorities must be involved in the process. One that is responsible for telecommunication regulations, and the other, which is responsible for aeronautical regulations. Before an authorization is issued, detailed coordination on national and international scale may be required to assure that the proposed station will not cause harmful interference to the operation of other legitimate systems. The ITU studies have been continued until now, focusing on protection against interference and on efficient use of the radio frequency spectrum. The World Radiocommunications Conference, held in Istanbul in 2000, has decided that the frequency bands 1885...1980 MHz, 2010...2025 MHz, and 2110...2170 MHz in Regions 1 and 3, and the bands 1885...1980 MHz and 2110...2160 MHz in Region 2, may be used by HAPS worldwide on a co-primary basis. The use of HAPS as base stations within the terrestrial component of IMT-2000 is optional for administrations, and such a use should not have any priority over other terrestrial IMT-2000 use. Furthermore, these frequency bands may be used by other co-primary services, fixed and mobile, in accordance with the radio regulations. The conference decided also to study additional frequency allocations for HAPS between 16 and 32 GHz, focusing particularly (but not exclusively) on the bands 27.5...28.35 GHz and 31.0...31.3 GHz. The Radiocommunication Assembly held in Istanbul in 2000 recommended minimum performance characteristics in terms of co-channel power flux density (pfd) limit on HAPS operating as an IMT-2000 base station.22 These recommendations have been approved by WRC-2000.23 The HAPS’ emissions at an administration’s borders should not exceed -121.5 dB (Wm-2MHz-1), unless agreed otherwise with the affected neighbouring administration. This limit is independent of the exact use of the band by these administrations. In addition, the assembly recommended out-of-band pfd limits on the Earth’s surface not exceeding -165 dB (Wm-2MHz-1). That requirement is aimed at protection of mobile earth stations and fixed stations operating in bands adjacent to those used by HAPS. To protect fixed stations from interference, a HAPS operating as an IMT-2000 base station should not exceed - in the band 2025...2110 MHz - an out-of-band pfd levels on the Earth’s surface shown in Figure 10. Moreover, these HAPS may not interfere with space stations operating in the band 2025...2110 MHz. This requirement concerns all intended, out-of-band, and spurious emissions. The spectrum emitted by any station may not cause harmful interference to services using the adjacent frequency bands. Here, the radio astronomy service is to be treated as a radiocommunication service.25,26 , All these restrictions are to be reviewed at the forthcoming WRC-2003. The 2003 conference may also wish to address the sharing, compatibility, and coordination issues between HAPS and some other existing systems/ services. Among them, there are personal communication services (PCS), multi-channel, multipoint distribution service (MMDS), or multipoint communication systems/ multipoint distribution television systems MCS/MDS), as the conditions of their co-existence have not been agreed yet. The High Altitude Platform Stations are expected to provide, in a cost-effective manner, a multitude of telecommunication and other services over large areas. Known also as stratospheric repeaters, they may operate individually or be interconnected with other similar HAPS and/or terrestrial and satellite-based stations. Compared to terrestrial telecommunication systems, the HAPS offer high signal arrival angle, largely unobstructed signal path, and large coverage area - like satellite-based systems but at lower cost. They can use most of conventional base station technology and terminal equipment. Compared to satellites, they do not require any launch vehicles, they offer much shorter signal path. They can be brought down to Earth for upgrading or repairing, and be re-deployed again. They can be kept quasi-stationary or be moved from one place to another on their own. Solar-powered platforms are environmentally friendly, and aerostats require less energy than aerodynes to do the same work in space. The HAPS have been under development for a number of years. In spite of the progress made, however, no HAPS were in commercial operation at the time of this writing. The requirements imposed are new and difficult to satisfy. The critical elements include materials, endurance, aerodynamics, station keeping/ controlling, solar panels and regenerative fuel cells, and launch/ recovery. The station operation at stratospheric altitudes depends on meteorological conditions, which are not very well known yet. Eventually, the technological problems will be solved and HAPS will be implemented widely. It is only a question of time (ironically, the recent Iraq war can substantially accelerate that process). International cooperation is needed here to avoid incompatible standards and regulations that may kill the chances of global applications of such stations. Proprietary technologies and intellectual property rights may lead to the same results: the technology may become rejected not because it is bad, but because a group of interests do not want it to be implemented. However, whether or not the high altitude platform stations will widely be used depends not only on the successful technologies, standards, and regulations, but also on policy decisions and market forces that are unpredictable. Prof. Dr. Ryszard (Richard) Struzak (r.struzak@ieee.org) is Co-Director of school series on radio at the International Centre for Theoretical Physics (ICTP). He is past Vice-Chairman of the ITU Radio Regulations Board and Co-Chair of the Spectrum Management/ Utilization WG of International Union of Radio Science (URSI). Prof. Struzak served as consultant to the UN, ITU, World Bank and governmental and private sector entities in number of countries. He was Editor-in-Chief and Chairman of the Advisory Editorial Board of Global Communications. Earlier, he headed technical department at the International Radio Consultative Committee (CCIR) of ITU for more that nine years. Prior to joining the ITU, he served as university professor and head of national R&D EMC and antenna laboratories in Poland. He has co-founded the International Wroclaw EMC Symposium and served as its officer during the period 1972 -2002, including duties of Symposium Chairman and Program Chairman. An Academician of the International Telecommunication Academy and IEEE Fellow, he was honoured by two international awards, Silver Medal of ITU, and numerous national awards and decorations. He received BSc, MSc, PhD, DSc, and the rank of full University Professor for life. RR 5.388A; WRC-2000 Resolution 122Rev. All content copyright © Entico Corporation 2003, unless otherwise agreed.